Ultimately, the truth seems to always have a way of coming out on the subject of doping.Â No matter what the evidence, almost all of these drug abusers all seem to take the route of denial.Â Remember Raphael Palmiero’s finger-waving denial before the Congress in 2005? What a beautiful set of messages to be sending to all of the kids that look up to him and other stars as role models! !Â Parents, this is a perfect teachable moment!Â Take the opportunity to use this example to talk to your kids over the dinner table TONIGHT. 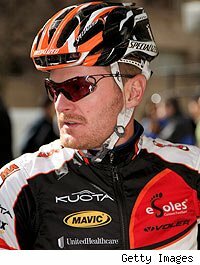 NEW YORK (AP) — Disgraced American cyclist Floyd Landis has admitted to systematic use of performance-enhancing drugs and accused seven-time Tour de France champion Lance Armstrong of involvement in doping, the Wall Street Journal reported Thursday. Landis, who was stripped of his 2006 Tour de France title for doping but had always denied cheating, sent a series of e-mails to cycling officials and sponsors acknowledging and detailing his long-term use of banned drugs, the newspaper said. The report said Landis wrote in the e-mails that he started doping in 2002, his first year racing with the U.S. Postal Service team led by Armstrong. Landis also admitted to doping in an interview with ESPN.com. Landis also accused American riders Levi Leipheimer and Dave Zabriskie and Armstrong’s longtime coach, Johan Bruyneel, of involvement in doping, the Journal reported. Armstrong is currently competing in the Tour of California and couldn’t be reached for comment. Neither could Bruyneel, Leipheimer or Zabriskie. The Journal said it had seen copies of three e-mails sent by Landis between April 30 and May 6, and that he had copied in seven people on the messages, including officials with USA Cycling and international governing body UCI. Landis served a two-year ban after testing positive for elevated testosterone levels at the 2006 Tour. He was the first rider stripped of a Tour de France title.